Denny's menu in all its glory. While IHOP's across the country are handing out pancakes to help the kids, Denny's are doing their part to confuse the young ones plugged into Twitter. In today's installment of social media experiments gone awry, Denny's has tried—and failed—to embrace Twitter. 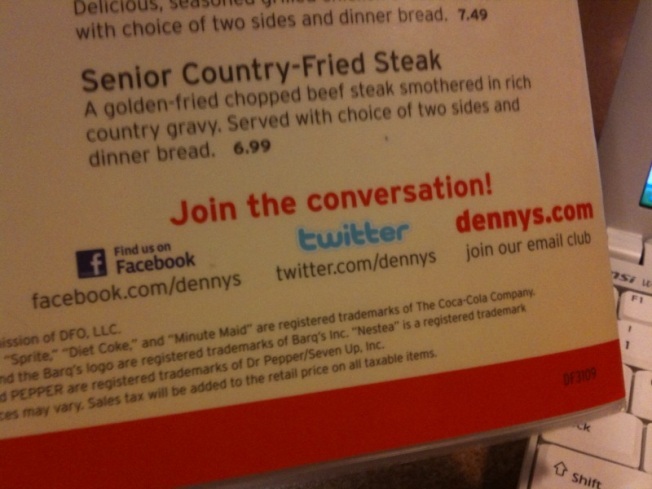 On the back page of Denny's dinner menus, there's a "Join the conversation!" section that implores diners to follow Denny's on Twitter at twitter.com/dennys. Thing is, that's the Twitter feed of a Taiwanese man named Dennys Hsieh. Denny's real Twitterfeed is http://twitter.com/DennysAllnightr. More than 7,000 people have been able to figure out the difference.